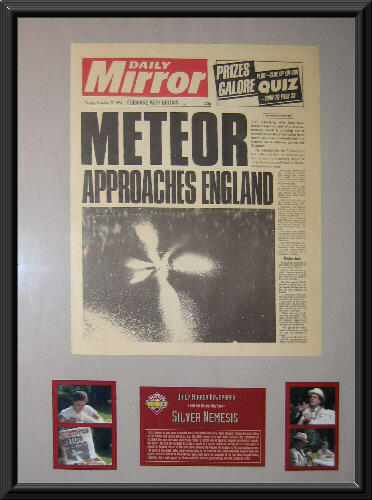 This screen prop was used in episode one of the Doctor Who Story "Silver Nemesis" staring Sylvester McCoy as the Doctor and Sophie Aldred as Ace. This 25th season three part serial (7k) was first transmitted on 11/23/88. 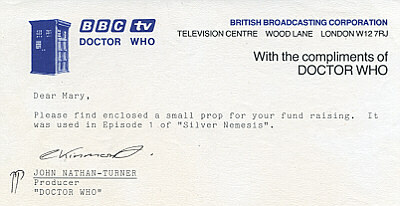 This was the silver anniversary show for Doctor Who. At about six minutes into the first episode, the Doctor and Ace are listening to a Jazz concert in a garden restaurant setting. 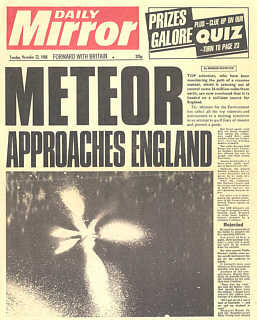 Ace lifts this paper to check the football scores on the back while showing the viewers the headline of the approaching meteor. The paper is one sheet folded in half with printing on the front and back. When opened the inside is blank. The meteor article is limited to the first two paragraphs with the remainder of the text about bargain holiday vacations. Put a real copy of the Mirror inside this sheet of paper and you have the completed effect. The Doctor and Ace sit back to enjoy a Jazz concert while they soak up a bit of sun. 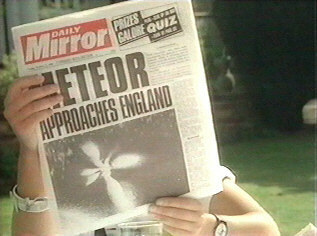 Ace checks the football scores on the back of the Daily Mirror exposing a glimpse of the upcoming adventure. The Doctor meanwhile tries to remember why he set the alarm on his pocket watch, which is currently interrupting the mellow tunes with a very annoying beeping. 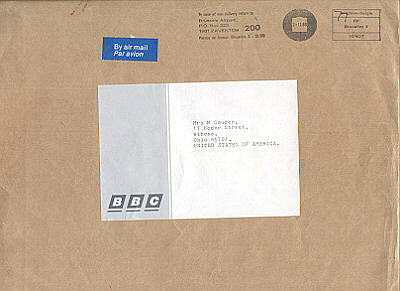 The paper was sent to Mary by the Doctor Who production office February of 1988 in response to a request for fund raising materials. John Nathan-Turner was always very generous to community activities. 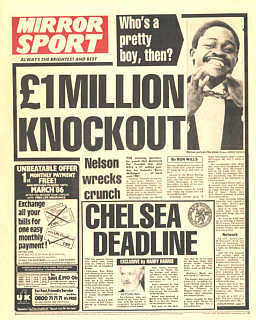 I bought the paper from Mary Souder of Rohnoke Virginia on the 12th of September 2002 through a eBay auction. It now resides in my collection located in Virginia, USA. The display is a 18"X24" commercial frame with the newspaper atop acid fee gray mat board. A description placard and photos of the paper in use were created with my favorite graphs program and mounted below the prop.